An unexpected place, the synchro pool saw Italy’s first title in Budapest: their mixed duet won the technical event by an unbelievably tiny margin over the Russians. A legendary European diver, Sascha Klein finished his great career with a well-deserved bronze in the 10m synchro with his good old partner Patrick Hausding. 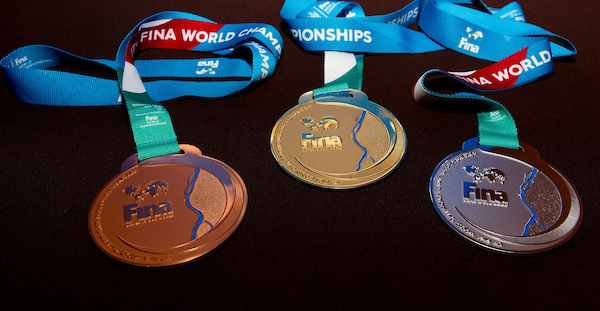 Italy is one of the aquatic powerhouses whose athlete can capture medals in all disciplines (but high diving, so far). They usually do that at all major events but perhaps even they were stunned learning that their first gold in Budapest came in synchronised swimming. After earning medals in open water and diving, the first title was quickly clinched, courtesy of Giorgio Minisini and Manila Flamini who upset the Russians and the reigning US champions. Only 0.03 points separated the mixed duets but the Italians could celebrate their first ever synchro world champions. The diving pool served as a fine environment for a happy ending of a fine career: Germany’s Sascha Klein bid farewell to the sport with a bronze medal in the men’s 10m synchro event. Together with his long-time partner Patrick Hausding they managed to finish on a high by making the podium, though this time they don’t have the chance to upend the Chinese (what they did in 2013). Russia’s Aleksandr Bondar and Viktor Minibaev captured the silver. The open water swimmers had a rest day so the European medal haul was temporarily suspended at Lake Balaton – in the meantime the men’s water polo tourney took off a great start. Italy, Hungary, Serbia, Croatia and Russia all began with a convincing victory, while Greece managed to overcome Spain (8-7). Montenegro, runner-up four years ago, caused some surprise by blowing away their win against Canada: the North Americans staged a 0-4 run to save the match to an 8-8 draw.